Single punch tablet machine have absorbed foreign advanced technology to aid in its developing. 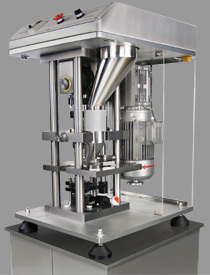 It is a continuous, automatic tablet machine that is designed for departments such as pharmacy, chemical industry, electrical industry, food, laboratory which needs to make powder, and granular raw material into tablets. This machine has adopted multiple novelty in its design, thus guaranteed safety and efficiency during the production process. 1.Entirely enclosed structure of the machine is design to avoid cross dust pollution, meet the GMP. 2.The Machine has safety protector installed, is also more rationally humanized. 3.Four posts cuboids structure of the machine is designed for larger operation space. 4.Outstanding carry capacity is suitable for variety range of the tablet production. 5.Single transmission system design makes the machine operates steadier and at a lower noise level.